What drew you to take on scenic design for this production? After reading the script I was really interested in the chance to do a realistic “outdoor” see with flowers and trees, etc. The chance to work with Jason [Alexander] was a great bonus as well! 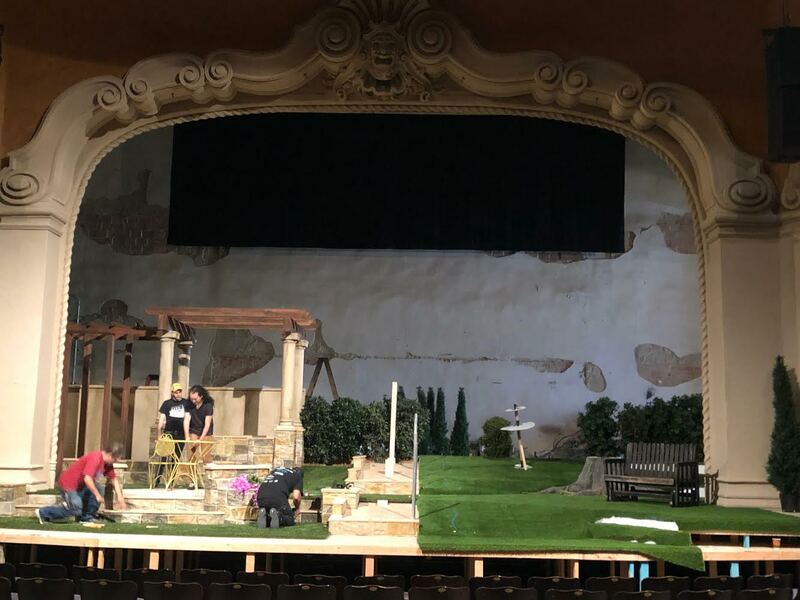 How does your scenic design differ from other productions of Native Gardens? I have not personally seen any other productions but did see a few photos and the biggest difference (Jason’s big idea) was not to show the houses architecturally in any way and just focus the set on the backyards and property line. What are the biggest challenges/obstacles for this production? Did you encounter any iterations of the design that for some reason didn’t work out (i.e. limitations of the stage, materials, etc)? I went through 3 versions of the ground plan and 1 model revision. Jason and I had a few early meetings prior to me designing so that I could get a sense of what he was hoping for. Research images and sketches were used and then I jumped right into building a model which was extremely helpful to see the topography of the set and the size of the tree. You’ve done Art Direction for TV/Film (Westworld Season 2 and The Wolf of Wall Street). Is there anything that carries over from Art Direction for Film to Scenic Design for the stage? Yes, these jobs are very similar, just with different scope. Often when working as an Art Director it’s about juggling multiple sets to make sure they work together to support the story and push the color and texture pallet throughout the film. But it really boils down to building scenery that looks good behind the actors! The oak tree is a prominent part of the play. Can you tell us more about your process from design to implementation? Why is the scenic design crucial to the plot of Native Gardens? The oak tree is a hybrid of elements. We rented the base and bottom 10 ft from the Old Globe. We purchased large branches and a rubber bark skin from Jackson Shrub and rented all the leaves from them as well. The carpenters and scenic artist have the challenging task to make all these elements come together in a cohesive way. The set design really dictates the special actions of the play and when a property line is in dispute, every inch matters! Native Gardens, the new neighborly comedy by Karen Zacarías and directed by Seinfeld’s Jason Alexander begins September 5.